The Amherst, NH Berkshire Hathaway HomeServices Verani Realty team made the rounds in their local communities. 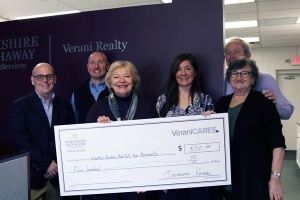 What began as a company challenge for all the Verani Offices getting people to take part in VeraniCares resulted in a day of Giving for the Amherst team. There were three winners of the VeraniCares 3.2.1 Contest. Amherst came in second with a prize of $2,000.00 that they could donate to a cause of their choice. The team decided to share the wealth so to speak and made contributions to SHARE in the amount of $1,000.00, and Greater Nashua Habitat for Humanity and the Boys & Girls Club of Souhegan Valley in the amount of $500 each. We believe that in order for our company to grow and succeed we need to play an integral role in enhancing the lives of our customers, clients and communities. Verani Realty chose the three organizations based how they contribute to improving the lives of others by providing food, clothing, shelter or mentoring young people to reach their full potential.